SE Uplift Sustainability Workshop – Space available! SE Uplift is holding their second Quarterly Sustainability Workshop this coming Saturday, February 16th. The event will focus on working with the city to create neighborhood green spaces. There is still space available, and they would love to invite more Buckman residents to the workshop. Read on for details! Could your neighborhood use more greenery? What if that gravel parking lot was a pocket park or that troublesome alleyway an orchard? If you are at all interested in creating new community green space or improving existing spaces in your neighborhood – we have the workshop for you! Please join Southeast Uplift for our second Quarterly Sustainability Workshop, highlighting green spaces and working with the city, including pocket parks, urban orchards and alley gardens on Saturday, February 16th, 2013. With project presentations, networking opportunities and useful tips, this free workshop will provide participants with the inspiration and practical tools they need to create alternative green spaces in their own neighborhoods! *Space is limited, so register soon! The Build It Green! Home Tour and Information Fair is coming up on Saturday, September 22nd. Word is it’ll feature a home in the Buckman neighborhood! The 11th annual Build It Green! Home Tour and Information Fair is a self-guided tour of green remodels and new homes around the Portland metropolitan area. Tour-goers pick up great ideas for their own projects by visiting with homeowners, designers, do-it-yourselfers and contractors about accessory dwelling units, solar panels, ecoroofs (green roofs), rainwater harvesting, natural landscaping, affordable housing, water and energy conservation, natural building materials, alternative construction techniques and much more. Volunteers are also needed for the tour; free admission! A group of neighbors is organizing a bike tour of inner-Southeast Village Building Convergence sites this weekend. Read on for details. I’m writing to invite you to the Pedalpalooza bike tour of inner-Southeast Village Building Convergence sites this coming Saturday, June 30th. This will be a potluck-style three-course meal bike-ride, so feel free to bring something easily transportable to share! We also encourage you to bring your own eating utensils. We will meet at St. David of Wales Church (2800 SE Harrison St.), which was the main VBC venue, at 5 pm to see their placemaking project and enjoy some salad as the first course of our potluck. Around 6 pm we’ll arrive at our second potluck destination, the intersection painting at 16th & Brooklyn, where we will have our main-course dinner items. 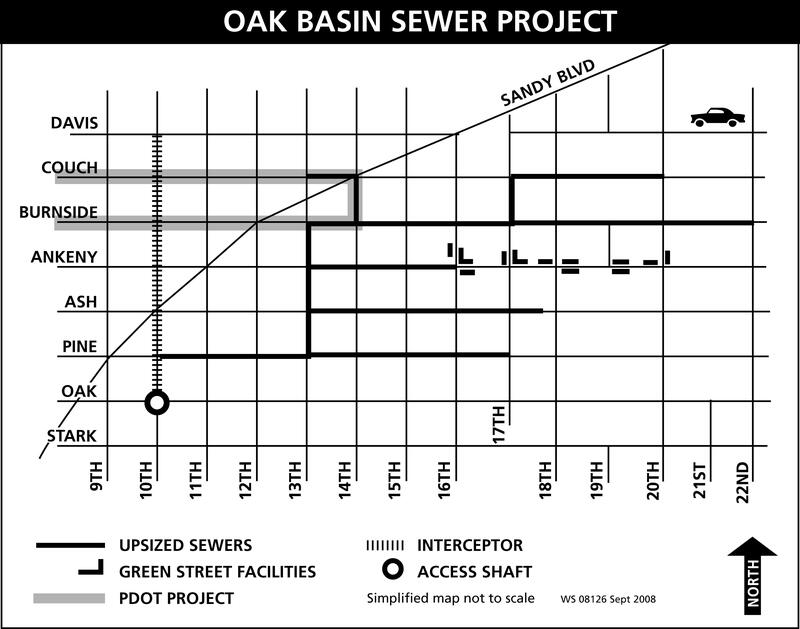 We will finish the site tour at the Buckman intersection, 15th & Alder, at around 7 pm. We will share dessert and compost any food waste accumulated over the course of the potluck-ride in the community compost. We also plan to bike by the Brooklyn Community Gardens and Communitecture sites en route to our potluck destinations. This will be a family-friendly event, so feel free to bring little ones and friends of all ages! It will also be a fantastic way to see some of the awesome placemaking visions our community has brought to fruition during this year’s VBC, while meeting others who are interested in building community creatively, joyfully, and by bike! Let me know if you have any questions, and I hope to see you on Saturday! The RWPC is offering a free outdoor watering gauge kit to anyone in the RWPC service territory from July 1st to August 10th. We’ll be publishing an article about it in the upcoming print edition of our newsletter, but you lucky blog readers get a sneak peak at it now! Did you know water usage in the Portland Metro area can more than double and even triple during the summer months? We Oregonians work hard to keep our lawns and gardens green in hot and dry weather. Many of us have heard the advice to water our lawn about an inch a week – and more during hotter weather – but few of us actually know what that means. In fact, many people actually overwater their lawns without realizing it. To help residents wise up about their water usage, the Regional Water Providers Consortium (RWPC) is offering a free outdoor watering gauge kit to anyone in the RWPC service territory from July 1 – August 10. 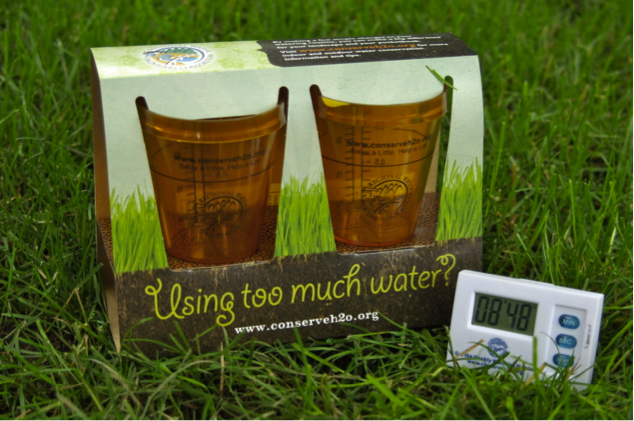 The watering gauge takes the guesswork out of watering by measuring how much water is landing on your lawn. The RWPC also posts a “weekly watering number” on its website (www.conserveh2o.org), which provides the recommended amount of water to keep lawns healthy through summer. To receive a free watering gauge kit, call 503-823-7528 or email RWPCinfo@portlandoregon.gov (please include your mailing address, water provider name and how you heard about the offer). 1. Water lawns and gardens early in the morning (before 10 am) or later in the evening (after 6 pm) when temperatures are cooler and evaporation is minimized. 2. Adjust your sprinklers so that they are watering your lawn and garden and not the street. 3. Water in several short sessions rather than one long session to allow for better absorption and to prevent run-off. 4. Adjust your mower to a higher setting. A taller lawn provides shade to the roots and helps retain soil moisture, so your lawn requires less water. 5. Add a shut-off nozzle to your garden hose and save about 5-7 gallons of water each minute your hose is on. The RWPC is a consortium of 23 local water providers plus the regional government Metro. Visit the consortium website – http://www.conserveh2o.org – for more information and resources to help conserve water at your home or business. Sign up for Community-Supported Agriculture produce! The Growers Alliance (http://www.growportland.org/growers-alliance) is a grower-led marketing collective managed by Grow Portland. The Growers Alliance was created in 2010 to help immigrant, refugee, and beginning American farmers reach direct markets with their produce. We’re offering a new Community Supported Agriculture (CSA) pick-up spot at the Urban Farm Store on SE Belmont this summer. To join our CSA, Portland residents sign-up and pay in advance of the season to receive a weekly box of freshly harvested, organically grown produce from our growers. Our season is 28 weeks long (May-November), and we offer different sized boxes of produce depending on the family size. These details can be found in our 2012 CSA brochure: http://www.growportland.org/wp-content/uploads/2012/03/2012_GP_CSA_Brochure.pdf. We were recently contacted about a hotline service available to homeowners who are looking for information on green home strategies. Read on for details. Metro, the City of Portland, Multnomah, Washington and Clackamas Counties offer a community resource serving our region: the Regional Green Building Hotline. For over four years, the Hotline has provided practical tips and useful information about green home strategies, including resources and incentives for new and existing commercial and residential projects in the region. The Hotline has answered thousands of questions about ways to reduce your carbon footprint, renewable energy, indoor air quality, salvage, doing more with less, training workshops and more. The free service is a bridge to the information you need to help you begin, wherever you are. Inquiries are welcomed from homeowners, renters, real estate professionals, non-profits, contractors, students, developers, business owners and design professionals in the tri-county area. It is the Hotline’s intent to inspire callers to incorporate as many sustainable choices, either material or behavioral, into their projects as they would like. The Hotline can also help callers overcome perceived barriers and obstacles around green building. Green Building Questions Answered Here! Looking for effective ways to save money on utility bills? Which local green programs and incentives are available to me today? What is the WaterSense label? How can I retrofit my house to healthily age-in-place? Where can I attend a free class to build a rain garden? Can I get a rebate for planting a tree? Does my new water heater qualify for a tax credit? Try this free community service from Metro, City of Portland, Clackamas, Multnomah and Washington Counties. Save the date for the 11th Annual City of Portland Build It Green! Home Tour on Saturday, September 22, 2012. Clean Energy Works Oregon (CEWO) is a non-profit program established to reduce energy waste by working with homeowners to make improvements to their homes’ energy efficiency. The program includes no-money-down financing. CEWO partners with local businesses to perform the work on your home. One of those businesses is Hammer & Hand. Hammer & Hand recently contacted us about publicizing a rebate that CEWO is currently offering. Read on for details. Hammer & Hand and Clean Energy Works Oregon are partnering up to help Portland homeowners improve the energy efficiency and livability of their homes by offering free “whole-house” assessments and incentives in the form of rebates reaching $2500 and no money down financing. Hammer & Hand’s free “whole-house” assessment helps owners identify ways to make their homes more energy efficient and comfortable, like installing new insulation or upgrading an old heating and cooling system. To receive the maximum level of instant rebate on your home’s energy remodel sign up for Clean Energy Works Oregon’s $500 Spring Bonus before it expires on April 30th. To sign up, visit Hammer and Hand’s Clean Energy Works Oregon’s web page (http://www.hammerandhand.com/cleanenergyworksoregon), click on the Clean Energy Works Oregon button and fill out the form using rebate code “CNHHA”. Questions? You can reach Hammer & Hand’s Home Performance Team at 503.894.1198. Local nonprofit Grow Portland is gearing up for its third annual Seed Club. For the Seed Club, Grow Portland buys organic vegetable seeds in bulk from socially responsible suppliers. These seeds are repacked into smaller sizes and made available to home gardeners, schools, and non-profits at affordable prices. This March and April, Grow Portland is hosting four sessions to pack these seeds. At these sessions, gardeners have a chance to socialize and learn with other growers, pack vegetable seeds, and take home 15 seed packets of their own. Our Buckman neighborhood packing session will be Monday, March 12th 7-8:30 pm at Green Dragon (928 SE Belmont St). Gardeners sign up online in advance to attend. See our website to sign up, and for more information on membership options for schools and nonprofits: http://www.growportland.org. Contact Lauren with additional questions: lmorse@growportland.org, 503-858-0216. Join Transition PDX to view the film “The Nature of Cities”, by Timothy Beatley (40 min) and a discussion about the film and Portland Plan. Beatley is recognized expert on sustainability and green cities. We will be joined by Mike Houck, a City Planning and Sustainability Commissioner and author of the book “Portland Wild”. Matt Wickstrom, city district planner of SE Portland will also join us for part the othe meeting to discuss and answer questions about the Portland Plan process. The film “The Nature of Cites” explores efforts by cities in the US and Europe to integrate nature and sustainable design into the fabric of modern cities. Beatley is the author of numerous books, including “Green Urbanism: Learning from European Cities,” “Native to Nowhere: Sustaining Home and Community in a Global Age,” and most recently “Biophillic Cities, Integrating Nature Into Urban Design and Planning. This meeting is a prelude to our discussion in October about the forthcoming draft of the Portland Plan and our input to the City’s Planning and Sustainability Commission in November. We will try to equal or improve on our work on the Climate Action Plan of a few years ago. The Portland Plan is a twenty-five year strategic plan that will guide Portland’s future. It is important to all of us and it will allow us to get our message and goals into public policy. For more information about the Portland Plan go to: http://www.portlandonline.com/portlandplan. Portland City Council is currently considering a proposal that will enable people to compost food scraps by placing them in their green yard debris roll cart instead of the garbage. A video (featuring Mayor Sam Adams) and FAQ are available here. The City of Portland Bureau of Planning and Sustainability is throwing its annual information fair on eco-friendly building practices, along with a self-led tour of area homes. Read on for the details. Please note: the Buckman Historic Association will also have a booth at the information fair! The City of Portland’s tenth annual Build It Green! Home Tour and Information Fair features twenty-two green remodels and new homes around the Portland metropolitan area. Many of the homes and affordable housing include solar panels, ecoroofs, rainwater harvesting, natural landscaping, water and energy conservation, reused building materials, alternative construction techniques, small footprints and much more. Homeowners and contractors will be available to share their personal experiences and to answer questions. A FREE family-friendly information fair will be a prelude to the tour with green vendors, demonstrations, food, drink and music. Information Fair: 10 a.m. – 2 p.m.
Home Tour (self-guided): 11 a.m. – 5 p.m. Presented by the City of Portland Bureau of Planning and Sustainability. Sponsored by Metro, Energy Trust of Oregon, Solar Oregon, Oregon Home magazine, and City of Portland Bureaus of Environmental Services, Development Services and Water. 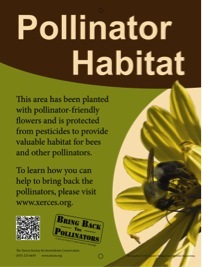 For more info: visit http://www.portlandonline.com/bps/builditgreen, e-mail greenhotline@portlandoregon.gov, or call 503-823-5431. Staff will make reasonable accommodations for people with disabilities. Please notify us no fewer than five (5) business days prior to the event by phone at 503-823-7700, by the TTY line at 503-823-6868, or by the Oregon Relay Service at 1-800-735-2900. Kerns/Buckman Neighborhood Cleanup: This Weekend! The time is almost upon us! This Saturday marks the annual Kerns/Buckman Neighborhood Cleanup event, a surer sign of spring than some mangy old groundhog (no offense to groundhogs). Accepted materials: Bulky waste, yard debris, metal, styrofoam (no peanuts), batteries (no lithium or car batteries), tires and e-waste (including computers, cell phones, LCD monitors, printers and others). Not accepted: Hazardous waste, paint, concrete, or dirt. Contact Metro for hazardous waste disposal. Paint cans without lids and dried paint are acceptable. Donation: $5-30 depending on load. If you have questions, please call email kernsna@gmail.com or call 503.704.4095 prior to the clean-up. This year, we’ve added an additional twist to the event. We’re coordinating a Graffiti Collaboration Clean-up effort that will identify and remove graffiti with the help of contracted removal crews. Volunteers are also needed on-site to help with the clean up efforts. If you are interested in volunteering, please contact kernsna@gmail.com. Secretary of State Bill Bradbury has arranged with the Sunnyside Neighborhood Association to give his climate change presentation to a crowd of SE Portland residents. The event will be held on Tuesday, September 30th, from 6:30-8:30 pm at the Sunnyside Methodist Church (3520 SE Yamhill St).